China says it's "not worried in the slightest" by mounting international concern over the death sentence handed to Canadian Robert Schellenberg for drug smuggling. China said on Wednesday it's "not worried in the slightest" by mounting international concern over the death sentence handed to a Canadian for drug smuggling. Monday's sentence for Robert Schellenberg for smuggling 222 kilograms of methamphetamines prompted Prime Minister Justin Trudeau to accuse China of "arbitrarily" applying the death penalty. The United Nations said it was opposed to the death penalty apart from exceptional circumstances, and Australia's acting foreign affairs minister, Simon Birmingham, said he was "deeply concerned" by the case. 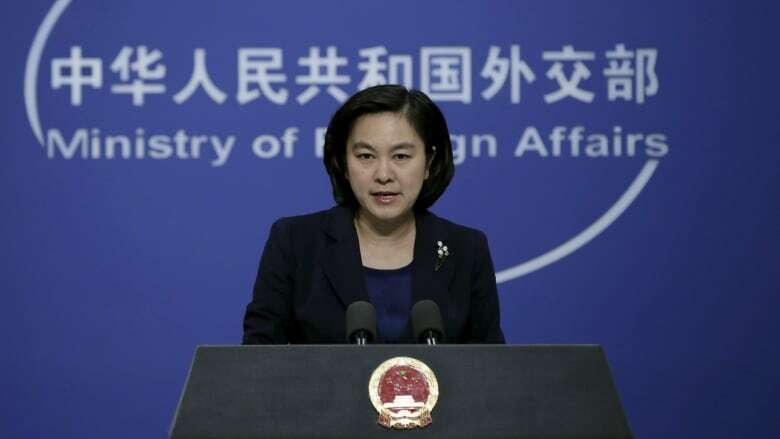 Speaking at a daily news briefing in Beijing, Chinese Foreign Ministry spokesperson Hua Chunying said Canada's "so-called allies could be counted on 10 fingers" and that they do not represent "the entire international community." Foreign Affairs Minister Chrystia Freeland dismissed the remark saying Canada is getting far more support from its allies than perhaps the Chinese regime is prepared to admit. "The EU alone, which has issued a statement, is a union of 28 countries and we're very pleased to have the support from the EU which is a great partner and ally," Freeland told reporters in Saint-Hyacinthe, Que. "It is of course on the basis of friendship with Canada, but more than that, it is on the basis of a much broader recognition of the principle that we are speaking out about that we are getting such strong support from our allies," she added. Freeland added that she had spoken with U.S. Secretary of State Michael Pompeo on Tuesday and had not only received support from him on that call, but was pleased to see that support was made public in a statement earlier today. The statement said Freeland and Pompeo "expressed their concerns about the arbitrary detentions and politically motivated sentencing of Canadian nationals." Schellenberg's sentence has further strained relations between China and Canada, already aggravated by the December arrest in Vancouver of Meng Wanzhou, chief financial officer of Huawei Technologies, on a U.S. extradition request as part of an investigation into suspected violations of U.S. trade sanctions. The Global Times, a state-run tabloid with a nationalistic bent, said China "cannot be weak at this time." "Canada does not have any special cards that can allow Chinese law to bow its head to it," the newspaper said in an editorial on Wednesday. It also said Canada's protests would have no effect. Freeland said Tuesday that Ottawa had formally applied for clemency for Schellenberg, as it usually does for citizens condemned to death abroad. When asked if China typically listened to this type of request, Hua said the judiciary was not subject to "interference from administrative organs." "You ask whether China is willing to listen to the Canadian side's request, but I don't know if Canada's leaders or politicians have seriously listened to China's solemn position. "We have very clearly outlined the case's facts and its seriousness," she added. Schellenberg had appealed a 15-year prison sentence issued in November, but the court in Liaoning province sided with prosecutors who argued at a retrial that the punishment was too light.